I'm still very behind on watching Naruto, as my interest in it has faded in and out. But I've been able to pick up watching some episodes recently and I decided to draw this! It's sort of an answer to a picture I drew a couple years back, which I'll link below. (Does anyone remember it? It's been four years XD) This time I wanted to draw a happier scene ^^ This is available as a print here! *This could be considered AU since Sasuke's left eye is normal and both he and Naruto have their arms intact. I've been looking forward to seeing this finished! It turned out really good! Their outfits are all wonderful and very much them! I love the poses too. There's such a peaceful feeling about this pic. 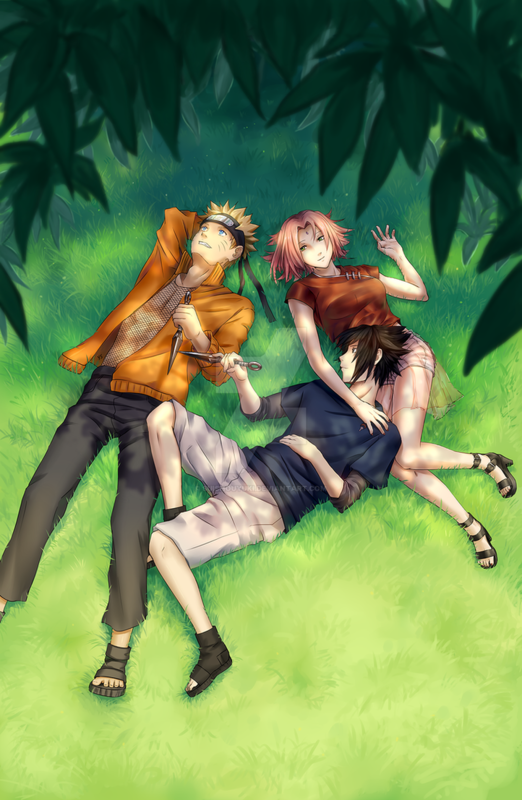 Team 7 is back together at last and everybody can relax for a change! The secret is LOTS OF REFERENCES, a brush tool, and blobs/grass-like strokes ;v; I blurred the leaves with Photoshop's Gaussian blur. I agree 100%. I don't mind Sasuke not having an arm, but the Rinnegan eye just seems to make him an entirely different person. 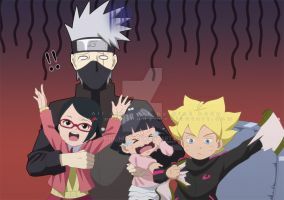 :/ It's a little less strange with Naruto since his synthetic arm is always wrapped. I guess it's those things that remind us, though, that nothing in life or anime can stay exactly the same.